Los Angeles used its 12th different starting lineup this season. OAKLAND, Calif. (AP) — David Lee had 19 points and 10 rebounds, Andrew Bogut grabbed 20 rebounds and the Golden State Warriors shook off a slow start to rout the depleted Los Angeles Lakers 102-83 Saturday night. Stephen Curry scored 18 points and Klay Thompson added 17 points to help the Warriors pull away with a 26-8 spurt to start the third quarter. Golden State went ahead 83-70 early in the fourth to put the game out of reach. Nick Young scored 20 points, and Chris Kaman had 17 rebounds and 10 points for the Lakers in a sloppy game by both teams. 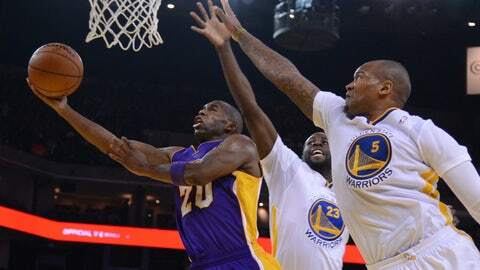 The Lakers committed 24 turnovers, while the Warriors had 18. Golden State shot 38.8 percent and Los Angeles shot 32.5 percent. Even though the Lakers were undermanned, the Warriors had failed to consistently take advantage of opportunities against short-handed teams lately. Gasol was the only player to start the first 26 games. Lakers coach Mike D’Antoni was hoping Gasol would be healthy enough to play Monday at Phoenix. At this point, the Lakers need anybody they can get. Los Angeles beat Minnesota on Friday night in its first game since Bryant fractured his left knee, but the Warriors — who struggled for long stretches again — were too much to overcome on consecutive nights. Thompson hit a pair of 3-pointers, and Bogut finished an alley-oop from Curry to highlight a 26-8 run to begin the third quarter that gave Golden State a 72-50 lead. It was the ninth time in Bogut’s career that he had at least 20 rebounds in a game. He had 12 points. The only drama left had little impact on the final score. Officials called a flagrant-2 foul and ejected Marreese Speights for hitting Young around the neck from behind to prevent the Lakers’ reserve from a breakaway dunk. Los Angeles never got closer than 16 points in the final quarter. NOTES: The Warriors improved to 2-1 against the Lakers this season, with the home team winning each time. … The Lakers have not lost a season series to the Warriors since 1994-95. … The teams meet for the final time this season on April 11 in Los Angeles.